“We [Cai and Xu] didn’t want the banking life anymore. Instead, we wanted to do something more exciting and challenging,” Xu comments. “When you start a business, you ask a lot of whys,” Xu said. In Xu’s opinion, the sunglasses and eyewear market has great potential. “Many people don’t realize the importance of sunglasses,” Xu said. Xu believes that the sunglasses industry will last for a long time, which is why they chose to enter the market. The founders have connections to manufacturing factories in China that were able to help them create the unique sunglasses MARSQUEST sells today. 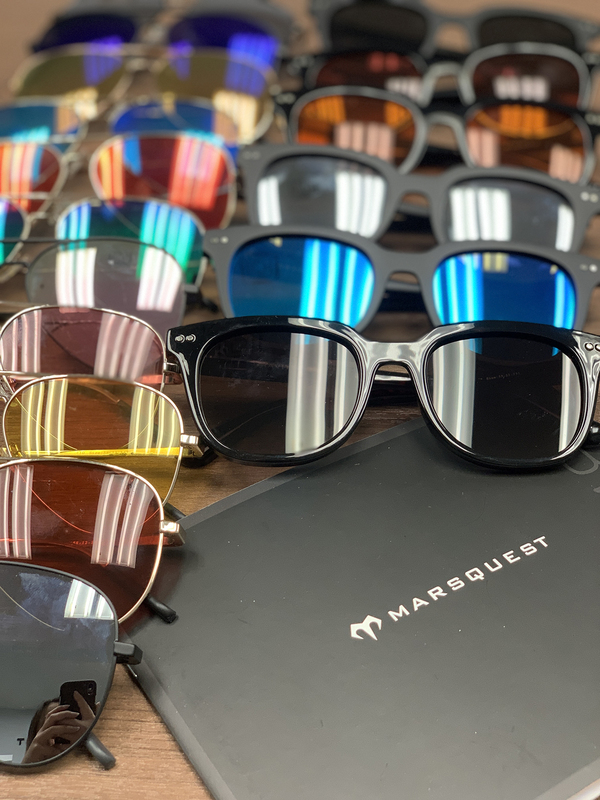 According to Sandy Hsu, MARSQUEST’s general sales manager, “the sunglasses are made of TR90 material, which is so durable that when you step on the material, it won’t break.” Furthermore, the lenses are polarized so that people’s eyes will be protected. In addition to sunglasses, MARSQUEST produces eyewear as well. Their specialty is the blue light protection that their eyewear provides. Blue light is the kind of light that comes from T.V.s, cellphones, and computers. “We want to ensure healthy eyesight among our customers,” Hsu said. Among MARSQUEST’s customers, a unique connection that many of them have with the company derives from Xu and Cai’s Asian Canadian background. The founders have incorporated both North American and Chinese influences into the brand. “We noticed that a lot of sunglasses and eyewear companies don’t cater to Asian faces. Our company delivers a product that fits for everyone,” Xu said. To date, more than 50,000 pairs of sunglasses and eyewear have been sold in Chinese markets through online platforms such as Alibaba and JD. MARSQUEST is also available over Amazon. The founders believe that MARSQUEST’s unique blend of Western and Asian features caters well to the likings and preferences of University of Waterloo students, especially as a significant portion of the student body is Asian and there are frequent Asian influences in the community. From their experience creating MARSQUEST, Xu advises students to “start early, keep going and doing something you love, even if it scares you.” In their early days, the founders experienced challenges with creating connections, learning how to kickstart their business, and dealing with inventory management. Over time, along with the help of mentors and knowledge gained from reading books, Xu and Cai have successfully overcome their difficulties. The name, MARSQUEST, is a fusion of the words “Mars” and “quest,” and is representative of the company’s ideals. “Mars is something a lot of people have been thinking about. It represents a possibility for people to get better,” Xu comments. Combined with “quest”, MARSQUEST is about the possibility of working towards reaching one’s greatest potential, which is what Xu and Cai are achieving with the quality of their sunglasses and eyewear.